I LOVE having such an ugly bathroom before, because no matter what, this is going to look better, right? Oh, and I just have to clarify: all of those Valspar cans in the post below are *trial* little half pint cans, not the full size. Yes, I'm a paint spaz, but not that bad, yet. We're still not finished attaching baseboards, but you don't care, right? The paint color is basically Smoke Infusion by Valspar (Lowes) I wanted a bluish, greenish, grayish color. At first, it was Iced Marble by Benjamin Moore but that was coming off too dark, so I took my little can of smoke infusion in and had them put white in the iced marble until it matched that. Did I mention I'm a paint spaz? The light fixture was from Amazon.com's 80% off lighting sale in the fall: $7.50!! The countertop is just one of those ready to go ones with the sink built in from Lowes and the cabinets are the original nasty ones~I just painted them a dark brown, lined them, and put new hardware on them. I can't believe the difference it made and the money it saved not having to get new cabinets. The hardware is from Ebay. 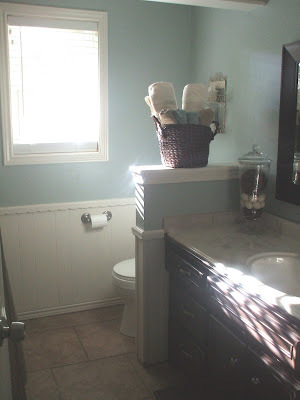 The towel ring (and my toilet paper holder) are from Wal-mart~they have a line of "Mainstays" brushed nickel fixtures that are super cheap when you compare them anywhere else. (I think they were around $5??) I found this shower curtain in the fall when Target was clearing out their back to college stuff for $3.24. It was pretty plain jane, so I added the ribbons at the top. Some little details: the basket is from Target global bazaar clearance with some cheap Walmart towels rolled in it. 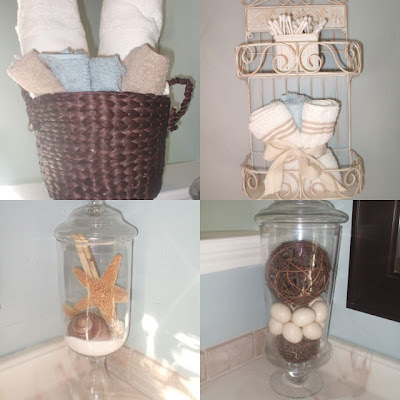 The little rack above the toilet is from a yard sale and the apothecary jars are from Target clearance and TJ Maxx with random fillers. FABULOUS! I love your attention to details! I just wish I could get all your details at your prices!! Only one more room left to debut! I can't wait! (How come we never got to see the bedrooms before and after--can I look forward to another post with that in the near future?) I love your style! Great job, even O's Nate would be impressed! Wow!!! 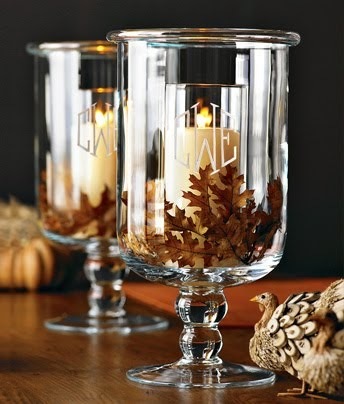 That really looks amazing!!! You guys have done such a FAB job!!! Wonder Woman has struck again! Looks great! I can't believe the difference! Your bathroom is adorable. You two are so good at the remodeling thing. I don't know how you find the time to do so much work, but it must be really satisfying to see the finished product. Great Job. I love it, Melissa! I thought you said you weren't going to have it done by the blessing, though. It looks great to me - wish I could be there to see it this weekend. I love the paint color, too. You are just amazing. Love the bathroom! Our bathroom in VA looked similar. 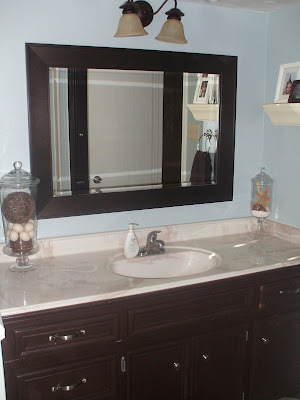 I love the smokey blueish color with the dark chocolate vanity! Good job martha! Ok Melissa! You need to start your own tv show on HGTV!!! You are amazing. You do kitchens, famiy rooms AND now bathrooms! Really, I am so impressed. I can't believe all you have done and with 4 kids. You are wonder woman:) And did I mention I LOVE the bathroom!!!!! Beyond Incredible. Melissa you are fantastic. You are an inspiration to all! Melissa, you are so creative! 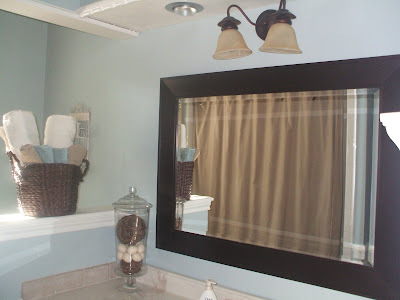 I love the ribbons atop the shower curtain! Simplicity at its best. Oh, and the pics of your bathing kiddos is adorable. Can I copy that idea!? 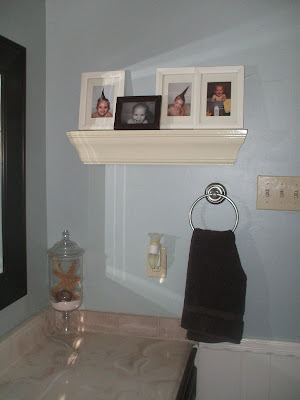 I'm going to have to go back through my kid's pictures and redo my bathroom shelf! 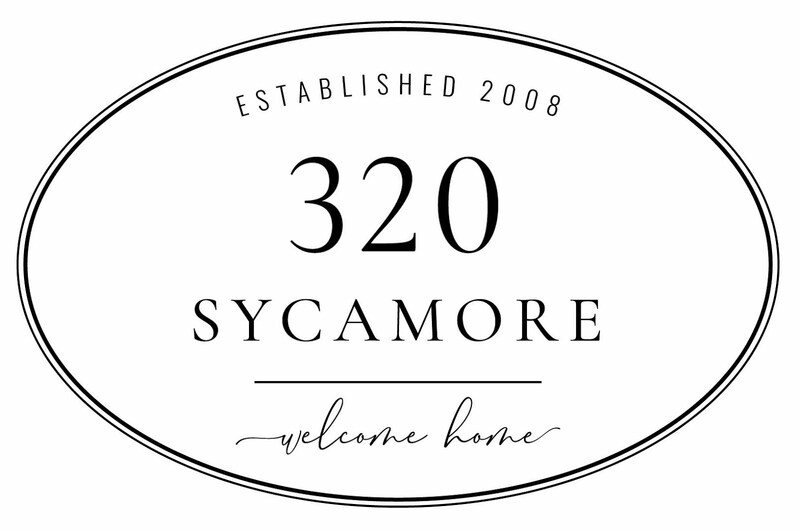 Ohh, don't remember how I found you but I love your site! You are a girl after my heart! 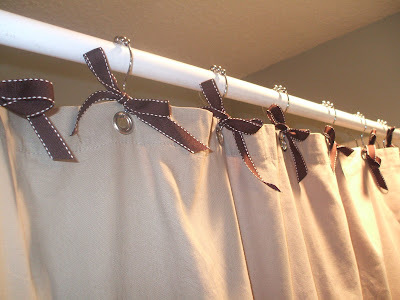 I love the ribbons at the top of the shower curtain, that is so adorable. 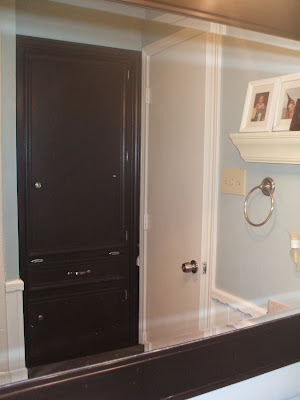 Can I ask if you prepped the cabinet doors at all before you painted them? Did you do any sanding or primering? Thanks! I love your bathroom! The accents are to die for, especially the basket with towels. I really love all the little detail you put into your rooms.